During an announcement about the cease-fire by Ghani, the president appealed to the Taliban to join a peace process going forward. "No one has the right to monopolize the peace process," Ghani said. "It is now the Taliban's decision, whether they want to keep killing or join the peace process." On June 5, Ghani announced the unconditional cease-fire coinciding with the end of Ramadan, a holy month of fasting and prayers for Muslims. A few days later, the Taliban announced they would adhere to a cease-fire through the first three days of Eid al-Fitr, a holiday marking the end of Ramadan. 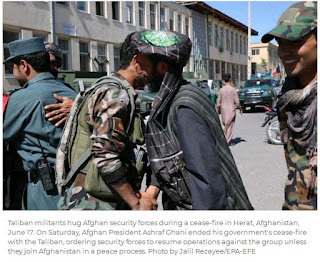 During the cease-fire, unarmed Taliban fighters were seen on the streets of Kabul, greeting civilians and taking pictures and videos. Ghani attributed the peace to the truce, which he said was "98 percent successful" and proved the Taliban fighters and civilians want peace. "[It is the] Taliban's turn to give a positive response," Ghani said. "I am ready to extend the cease-fire anytime when the Taliban are ready." Taliban spokesman Zabihullah Mujahid said earlier in the week the Afghan president's objective is for the Taliban to "lay down our weapons and accept the regime imposed by the invaders."